This fall, seven student teams across Baltimore – from public, charter, and private schools – were chosen from more than 30 submissions to compete in the Baltimore High School Innovation Challenge. The charge: develop an innovative idea that could be used to positively impact your community. This past December, parents, teachers, and students from across Baltimore City gathered for the first ever Baltimore High School Innovation Challenge. After each team made a five-minute pitch, judges – including the Warnock Foundation’s David Warnock, Shanaysha Sauls, Board chair of the Baltimore City Board of School Commissioners, Tom Wilcox, President, Baltimore Community Foundation, and Pamela King, of Open Society Institute-Baltimore – awarded the first prize, of five thousand dollars and the chance to be featured in the Baltimore Social Innovation Journal, to Cristo Rey Jesuit High School. 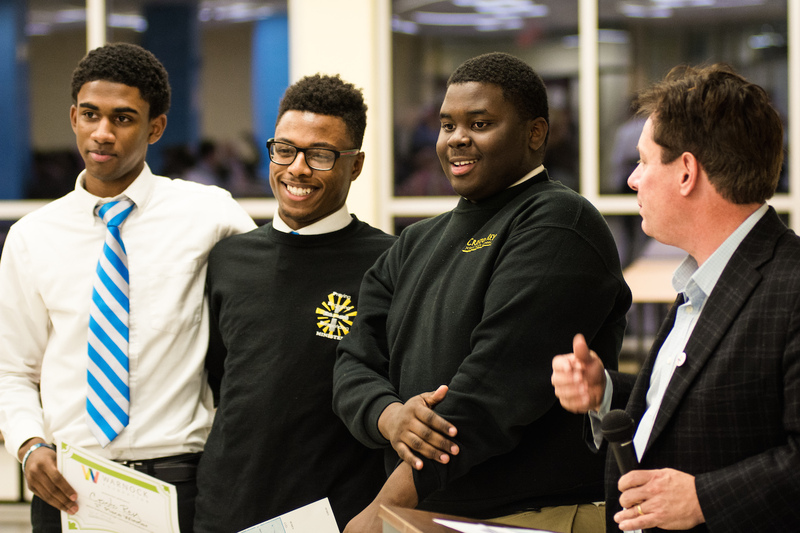 The project that netted Cristo Rey Jesuit High School their victory was the proposed development of a networking app. According to the team, which included Keynell Washington, Corey Hairston Jr. and Justine Midiay in addition to Lemuel Bourne, Cristo Rey supports a network that spans twenty-six schools across seventeen states but offers little in the way of community centralization. This lack of virtual communal space means that alumnae have few options when it comes to connecting to their alma mater – at a time when a strong digital presence is paramount. Recognizing this shortfall, the students began brainstorming in September about how to best solve that problem. The students’ research led to the conclusion that creating an app would be the ideal option. Not only would an application provide a space for current students to have their voices heard, it would supplant traditional, costly productions – school newspapers – with a resource that people can access via mobile device.